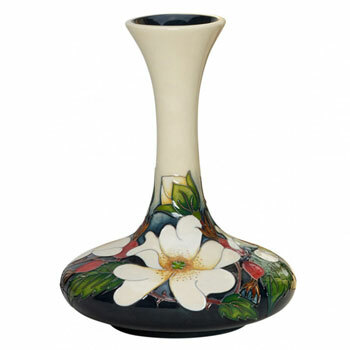 Moorcroft Eglantine 104-6 Discounts Apply ! This piece from the Royal Horticultural Society Collection depicting The Eglantine Rose Flower that on this super Vase. Rachel was inspired by the Sweet Briar Rose because of the Strong Apple Scented Leaves and is Recorded in Literature by Chaucer and Shakesper .